Washington (CNN) – Sen. Rand Paul, R-Kentucky, said Sunday the United States should avoid military involvement in Syria. He challenged Secretary of State John Kerry on his assertion America should launch a strike. "He's famous for saying, 'How can you ask a man to be the last one to die for a mistake?' I would ask John Kerry, 'How can you ask a man to be the first one to die for a mistake?'" Paul said on NBC's "Meet The Press." Kerry famously asked that question during his 1971 testimony at the Senate Foreign Relations Committee following his military service in Vietnam. Paul previously spoke against U.S. involvement in Syria, and though he did applaud President Barack Obama's decision to consult with Congress on the matter, he said the situation in Syria is simply too murky for American success. "I think the war may escalate out of control and then we have to ask ourselves who is on America's side over there," Paul said. "If the rebels win, will they be America's ally?" Ultimately, Paul said the Obama administration should diplomatically engage more effectively with China and Russia, two of Syria's closest allies. "I think the best outcome for all the major powers would be a peaceful transition in government. And Russia could influence that if they told Assad, 'No more weapons,'" Paul said. Wow, the combined amount of ignorance and vitriol on here is saddening. So many condemn and ignore simply because of useless labels. I don't always agree with Rand, but he is making good points (that most of you seem to ignore in favor of name calling). What is wrong with waiting for the UN inspectors to finish their report so we can get all the facts? Do we forget the history of Iraq so quickly? The issues of Syria, and most of the Mid East as a whole, are not black and white, good guys versus bad guys. And as our entire historical involvement in the region has demonstrated, we have a knack for backing the wrong side. And I appreciate that a President is finally following the Constitution and seeking congressional approval for War like engagements. I pray for a time we can let go of our entrenched "My Team vs Your Team" political beliefs and we can actually engage in real open debates based on facts and logical analysis that will produce the best results. Untill then, I guess most of you will just make yourselves feel better slinging ignorant insults like "Teabaggers", "Aquabuddha", or why a doctor doesn't deserve to be addressed as such. Does anyone really care what this buffoon thinks? He's been on both sides of this issue depending on what day of the week it is. Kentucky should be so proud having two of the lamest senators in the country only surpassed by what we have here in Texas. It's a sad state of affairs. Thank you, Sen. Paul. It's ironic to see Mr. Nobel Peace Prize itching at the chance to break international law. Also, we cannot afford to be the world's policeman. Too bad about the victims, but the other countries are not with us, then what are we supposed to do? You people commenting are really stupid. Some of you say rand took another position 4 days ago................He didn't. He said Obama's goal was to fight to a stalemate and not to win. That's why he doesn't support this strike along with other reasons. Also any clowns that bring up Bush as if rand is personally responsible for his actions needs mental help. Everyone with an IQ over 5 knows rand opposed Bush's policies. And anyone else attacking paul cited no reason what so ever. You clowns just hear the word "republican" and run the other way. Rand is not Bush,Romney,McCain. You clowns need to face it. Obama is a war mongerer who looks like a clown on the world stage. I would take paul over him any day!!!!!!! If Congress approves great. If they don't, oh well. The President is the Commander in Chief and can therefore do whatever he see's best. Look at the war mongering left. To funny!!!! Blue brains! To see all the liberals here support an un-declared, unconstitutional war with a country who has not threatened or attacked us just because Obama and CNN pushes it is incredible. Rand Paul was against Bush's intervention in Iraq for the same reason he's against Obama's intervention. We are not the world police and every military intervention only makes the US more hated and if more American's listened to representatives like Rand and Ron Paul, our country would be in much better condition from both a foreign and domestic policy perspective. End the status quo. Rand Paul 2016. Senator Rand makes looking at the Syria situation easy: there will be no American success, likely great failure, likely escalate war out of control...to WW3...& the rebels & Al Qaeda are opposed to the Americans & would make a worse Syrian government, so the entire situation will make it worse for the whole world. So the solution is for Obama to ask Russia & China & Iran to get Assad to agree to a peaceful government transition to have a non-Assad and a non-rebel government take-over as the government of Syria, one that uses no weapons at all, one that obliges with West & the East & the U.N. What Se Rand doesn't mention is that other part of the solution is to get the USA & its allies to stop giving weapons to the rebels & Al Qaeda...b/c if Assad has to give that concession, so does USA & its allies. It is almost immaterial what position the Republicans take. As policy-less chameleons they can be on all sides of any issue-IF they can oppose the President- which is still unfortunately, their only known goal. The House is a leaderless wreck, but the Senate does have the job to advise the President, and provide consent before permitting a military strike of questionable value. The GOP loves to throw it back that Democrats voted for the Iraqi war, and hence share the blame equally for that war. Well, the shoe is on the other foot now. What is their job, and what is their advice? I agree the US should not get deeply involved, but I do believe a response needs to be made to Assad's use of Chem weapons. It doesn't make any sense to me why the US wouldn't engage other countries in the Arab league to be front and center for an attack. Turkey, Saudi Arabia, and other like nations WANT to attack Assad – so let them, support them, but make it THEIR fight. I tend to agree there is no one in Syria on the US side. You have to pick the worse of 2 evils. Rand Paul is challenging Secretary of State John Kerry???? ?...Oh......the "chutzpa:........This person never knows when he's over reached his knowledge and abilities.....He should just "give it up" and "grow up"!!!! The issue will come up again how many are you all willing to see gassed, 1000 here a 1000 there, what 5000, 10000, 1 million, 6 million. This cat is unsafe. Do the only thing you liberals look through is "OMG ITZ A REPUBLICAN...BUSH!!!" 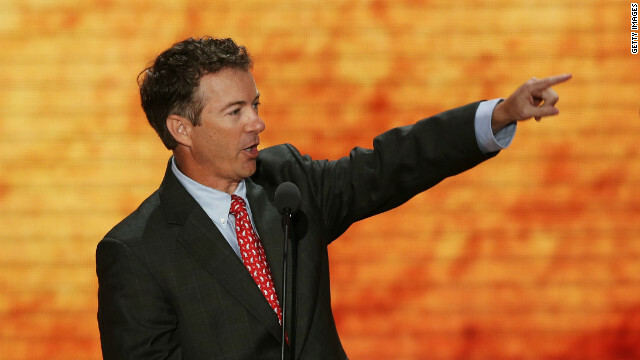 It doesn't take much effort to see Rand Paul has consistatnly against Syria intervention. You people need to dig your heads out of your party's you know what. And oh yea, Rand was against what Bush did so stop saying "Bush did it, so you can't say anything!" That is a logical fallacy and a half. Or my other favorite "Bush did it so it is ok if Obama did it!" It is WRONG when both presidents do it. Stop with the partisan politics this is a war we are about to go into and the only thing we can do is talk as if this is a partisan issue. This is not our war and the majority of americans are tired of war. When will this stop? Leave them alone and mind our own business. Bring all of our soldiers home from Iraq and Afganistan right NOW mind our own business like other smart countries do. take care of our own boarders here at home. Save American lives and money. Get Smart! The fatal flaw in Rand Paul's current statements on Syria is in his own words para 5 in the CNN post. He appears to believe Bashir Al Assad's Syria was an American friendly state... no way! Closest ties were to Iran and Russia!! Then how can we be sure the "rebel victors" will be on our side!! What kind of obtuse logic is that? It certainly is not remotely diplomatic or commonsense. The question he is dealing with ( rather should be) is whether the US can intervene in the interests of upholding an international convention banning the use of Chemical weapons or not.Obama has clearly said it is not the objective to specifically target Bashir Al Assad nor is it intended to support any specific element of the so called " Rebels" a generic inappropriate label when all of us know including President Obama that Al Qaeda ( related) factions are within the " rebel" side. To Name T Hill, look up Rand Paul's foreign policy experience on the net: he is a Senator of Kentucky for many years & sits on Committee on Foreign Relations and Committee on Homeland Security . Also look at his high level of education: he is a Doctor of Medecine. Also look at his family background: he is the son of Ron Paul, former Senator from Texas for decades. Growing up in that family meant lots of exposure to domestic & foreign politics all his life. Credentials? reems of them. as an Independent Voter, I don't always agree w/ Rand Paul, but he's right on this issue. It seems like this country never learns. We were very, very lucky we're not still in a conflict in Iraq. If we go into Syria, (where those people hate us, btw) we will never get out.......It may play out like Iraq, (and I'm afraid it will) we'll be there for 10 years, and will spend Billions & Billions.